Online education can have a real impact in the developing world. Last week, we needed to hire a programmer for a small freelance job. To my surprise, several candidates advertised they had completed programming MOOCs. These were young programmers in their 20’s, in countries like Pakistan and Thailand, who lacked college-level coursework, but are trying to launch freelancing careers based on online courses. Mobiles and eBooks will be a big deal in higher education by the end of the year, predicts a panel of 42 experts in education, technology, and business in a new report jointly released by a consortium and association related to higher education. 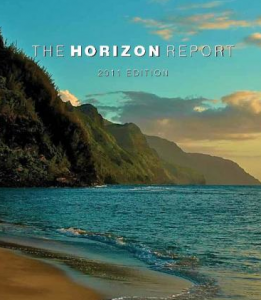 These predictions are gathered in the “2011 Horizon Report,” released today. Also, coming soon, these experts predict that by 2014, augmented reality and game-based learning will be important. And by 2016, they predict students will often use gestures to interact with computers, and that learning analytics will be common.